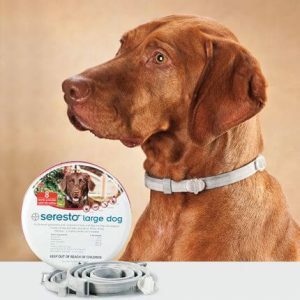 Learn all about the seresto collar which is used for both the cats and dogs. Also learn about the reviews and side effects of its use. Seresto is a unique polymer matrix collar that offers a continuous supply of two active ingredients: imidacloprid and flumethrin for effective 8-month protection against fleas and ticks. That’s one convenient, non-greasy, odorless flea and tick collar instead of 8 monthly treatments. Seresto is indicated for 8-month prevention and treatment of fleas and ticks on small and large dogs, and puppies 7 weeks of age and older. Seresto also kills chewing lice for 8 months. Seresto is different from conventional flea and tick collars. It employs a novel blend of materials, enabling a safe, controlled, low dose release of active ingredients over 8 months. This provides excellent protection for your dog, not only killing fleas and ticks but also repelling ticks before they bite which helps to protect your pet from the diseases these parasites can spread. The active ingredients are stored within the collar. They are released in low concentrations and are distributed over your dog’s hair and skin surface for 8 months. As active ingredients wear off over time, Seresto for dogs continuously replenishes the skin and coat with a new supply of active ingredients. Fleas and ticks are killed through contact with the active ingredients no biting required. Seresto is an effective, reliable alternative to monthly flea and tick topicals. This dual-action collar repels and kills fleas and ticks for 8 consecutive months. If a flea or tick is repelled, it cannot attach and transmit disease-causing organisms. Seresto is a flea and tick collar for dogs and cats that uses exciting, innovative technology to release the active ingredients in controlled doses over an extended period of time. This means effective long-term flea and tick control without the inconvenience of monthly applications. Seresto protects your pet from fleas, flea eggs, flea larvae, ticks, as well as sarcoptic mange on dogs without odor or mess. It is available in three formulations for Small Dogs up to 18 lbs, Large Dogs over 18 lbs, and Cats of all weights. Simply outfit your dog with a Seresto Flea and Tick Collar for slow, steady release of 2 active ingredients – Flumethrin and Imidacloprid proven to kill fleas and ticks. There’s no need to remember monthly topical applications. Plus, you’ll enjoy peace of mind knowing your dog is protected from these dangerous parasites’ associated diseases for 8 months. Seresto is available for small dogs and puppies, for dogs 7 weeks of age and older and up to 18 lbs and for large dogs and puppies, for dogs 7 weeks of age and older and over 18 lbs. Seresto Flea and Tick Collars are odorless, water-resistant, and safe to use with your dog’s existing collar. Each Seresto Flea and Tick Collar includes 3 clip-on reflectors to enhance your dog’s visibility. Active ingredients: acaricide (tick killing) Flumethrin and insecticide Imidacloprid. Seresto for dogs can help keep them protected from fleas and ticks for 8 continuous months. The innovative Sustained Release Technology of Seresto provides effective flea and tick protection in an easy-to-apply, non-greasy collar. You probably know that fleas and ticks can make life very uncomfortable for your cat. As parasites, they feed on the blood of your cat, leaving bites which can be painful. Infected fleas and ticks can also pass dangerous diseases onto your cat during this feeding process. With Seresto you can spare your cat all of this just finds out how to use it and protect your cat from fleas and ticks for up to 8 months. Kills and repels fleas and ticks for 8 continuous months in one easy-to-use, non-greasy, odorless collar. Quickly kills fleas within 24 hours of initial application. Re-infesting fleas are killed within 2 hours. Prevents tick infestations within 48 hours after application. Kills and repels re-infesting ticks in as quickly as 6 hours. Seresto collar reviews are the good ones. Peoples are surprised by its working power. One says, “After trying many products on my little Maltese, I have been elated that the Seresto Collar has finally done the trick. The cost is well worth seeing my pup free of all the scratching and sleepless nights he was enduring. I highly recommend that you stop wasting your money on those other products and invest that cost into Seresto’’. Seresto collar also have some side effects. Pets may experience some temporary irritation at the site of product application. If signs persist or become more severe within a few days of application, consult a veterinarian immediately. The Seresto dog collar ingredients can have side effects so let’s look at the effect that a Seresto flea collar for dogs may have, starting with flumethrin side effects. If your dog does react to flumethrin, Seresto collar for dog’s side effects may be varied. Side effects may include local dermatitis (skin irritation) with pruritus (itching) and erythema (red skin). Seresto lethargy is also a recognized symptom. Symptoms will depend on the dose, the formulation, and the kind of contact (skin, inhalation, ingestion etc.). Flea and tick collar side effects of this nature are not common, however. Side effects from Imidacloprid use can include fatigue, convulsions, lethargy and difficulty breathing. Unstable gait and tremors can also occur, but again, are rare symptoms and not common side effects of flea collars. © 2017 HAA Pets. All Rights Reserved.